If a resource is taking vacation time that you'd like to account for in your scheduling, you can add it to the resource's calendar. Tip: Don't overdo it! Accounting for every vacation day can make scheduling more challenging than it needs to be. A best practice is to only account for vacation time that will significantly impact your project's schedule. If a resource is just taking a day or two off, don't worry about it! Choose a resource from the For calendar list. Tip: Need to change the resource's full schedule? You can use the Change Working Time dialog box to adjust the resource's working and nonworking time. Select the vacation day(s) on the calendar. On the Exceptions tab, type a Name for the vacation day(s), and then press Enter. The Start and Finish dates are populated with what you had selected on the calendar, and the vacation is marked as nonworking. Any tasks that this resource is assigned to will now be scheduled around the vacation by, typically, lengthening the number of days it will take to complete the task. Some resources may have vacation time that regularly repeats during the project. For example, they may want every other Friday off. 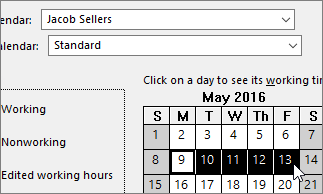 On the Change Working Time dialog box, select the vacation day you want to make recurring, and then click Details. Under Recurrence pattern, set how often the vacation day will repeat. Tip: You can also set a Range of recurrence if the vacation happens repeatedly and then stops. For example, if the resource is taking every other Friday off over the summer, but will resume a normal schedule in the fall.